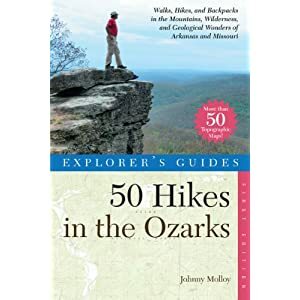 This book details 50 hikes that take place in the Ozark Mountains of Arkansas and Missouri, from the Buffalo Wild and Scenic River and Ozark National Forest of the Natural State, where incredible views await the hiker, to the special destinations of Missouri, including the highlands of Taum Sauk Mountain and the open vistas of Hercules Glades Wilderness in the Show Me State. Many treks along the master paths of the Ozarks, the Ozark Trail and the Ozark Highlands Trail, are included. Specific emphasis is placed on the most scenic destinations and wild backcountry areas that make the Ozarks unique. Hikes of varied lengths and difficulties are included. A helpful information section, trail map, trailhead directions and photo are included with each hike. A running narrative of the hike gives detailed descriptions, including trail junctions, stream crossings, interesting human or natural history along the way. This hike not only offers great views and a trip to an old homestead but it also traverses the highest point on the entire Ozark Highlands Trail. Leave the Morgan Fields trailhead, climbing the nose of Morgan Mountain, winding your way north to join Hare Mountain on a well designed trail. Along the way the wooded ridge narrows into a rocky razorback, dropping off steeply on both sides, availing great views before reaching the top of Hare Mountain. Once on Hare, the views really open up. A spur trail leads to a backpacking campsite, near which is the homesite of an Ozark settler who liked his neighbors lower than him and distant as well. Make a final trek on the Ozark Highlands Trail, reaching an outcrop that reveals waves of mountains in the distance and makes for an ample reward for your efforts. You may want to consider bagging two hikes on one weekend. The Spy Rock Loop hike starts near Redding Campground, which you pass en route to this trailhead. (See hike x.) Redding Campground has 25 campsites, a boat launch for paddling the Mulberry River, and is an ideal base camp for this hike as well as the Spy Rock Loop. Also, a backcountry campsite located atop Hare Mountain offers yet another camping option. From Exit 35 on Interstate 40, take AR 23 north for 13 miles to reach AR 215. Turn right on AR 215 and follow it for 3.1 miles to Morgan Mountain Road, Forest Road 1504. Morgan Mountain Road is just beyond the right turn to Redding Campground. Turn left on Morgan Mountain Road and follow it 4.0 miles to Morgan Fields trailhead, on your right. Leave the Morgan Fields trailhead, descending on a blue-blazed spur trail connecting you to the Ozark Highlands Trail. In just a short distance, reach the Ozark Highlands Trail. From here, it is 14 miles right to Little Mulberry Creek and left to Hare Mountain. Turn left here and begin westbound on the OHT. Cruise a rocky slope with scattered picturesque boulders. Immediately pass a little rock overhang with a wet weather fall. Pass a second stream that is more likely to be flowing if either of them will be, and then cross Forest Road 1504. Enter pine woods and bear right, resuming a northbound track. Take the nose of Morgan Mountain uphill, shortly drifting to the right-hand side of the mountain. Look for an old barbwire fence indicating this once may have been cattle country, though it is hard to believe with the state of the forest now — oaks stand tall and sturdy. Gain obscured views to your east. Shortly regain the crest of the mountain. The valley of Mountain Creek drops off to your left. Looking farther up the watershed, Mountain Creek splits into a Right Prong and Left Prong. A prominent mountain to your left stands between the prongs. The OHT eventually makes it there but that is beyond the scope of this hike. The OHT slips over to the left side of the ridge, joining an old stone fence. The flat stacked rock reveals former Ozark settlement. Regain the ridge crest once again. Here, the forest is less thick due to many fallen trees. The trailbed traverses slabs of rock then scoots over to the right side of the ridge, skirting a clearing to your left. Look for a crumbly stone fence on the right-hand side of the ridge. Imagine all the work it took, moving the stones to add to the fence, day after day, by hand. They didn’t need to join a fitness club back then — life was just one continuous fitness test. Leave the crumbled fenceline, crossing an ATV path. Begin to make the climb up Hare Mountain. The OHT switchbacks to the right just before making a break in a cliffline. Once again rejoin the crest of the ridge. The trail designers here did a fine job, taking you by scenic sites yet being practical about the ascent. Keep winding your way up, leaving the ridgecrest once again only to rejoin the nose the ridge again — it seems like you’re almost the top. But the OHT keeps climbing. Here the ridge narrows into a rocky razorback with a few scraggly trees still. Reach OHT mile marker 43 (as designated from its western terminus near Fort Smith). An outcrop just before you make mile 43 avails a view into the Mountain Creek watershed and beyond to the Mulberry River Valley. The ascent sharpens. Notice the wind stunted trees. Clear yet another low bluff line. The Herrods Creek valley drops steeply off your right. The ridgeline narrows further still, with accompanying shorter and more scraggly trees shaped by winter winds and simply cannot grow as tall on this razorback. Rock outcrops provide vistas as you reach a trail junction at 1.9 miles. Head right here on the blue-blazed track heading to a campsite, offering a level spot, fire ring, and picnic table. Continue on, passing more campsites beyond, on this nice mountaintop flat. Circle around some heavy brush and then reach the stone chimney of the settler who lived up here, atop Hare Mountain. Imagine the solitude. Leave the chimney and backtrack to the OHT. Rejoin the OHT, still heading away from the trailhead. Resume an uphill grade. An old stone fence stands to your right, undoubtedly made by the same person who lived at the homesite. To your left, the ridge of Morgan Mountain stands in bold relief beyond on either side of Mountain Creek and Herrods Creek. The stone fence goes quite long way, though it has fallen in places and crumbled where trees have toppled onto it. The OHT becomes squeezed between a bluff line to your left and the stone fence. The path leaves the stone fence area and begins a slight downgrade. Reach an outcrop on your left. This is a good place for a final vantage and a place to turn around. The views here extend as far as the clarity of the sky allows. Mountain Creek forms a huge opening below, allowing views beyond the Mulberry River valley, into which Mountain Creek flows. This view, among others, will raise your desire to thru-hike the entire Ozark Highlands Trail, a 165-mile endeavor.